Kosovo is pouring money into major sports that can raise the country’s international profile – which is not good news for its fledgling curling team as it gears up for the championships in Norway. Meriton Zeneli and Peter Andersen, the coaches of the Kosovo curling team, dream of making curling more than just a marginal sport in the country. 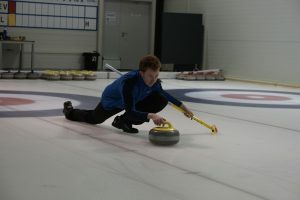 Their training schedule is heating up as the World Curling Mixed Doubles Championships in April in Norway inch closer. Sliding rocks across the ice since he learned to walk, Andersen, along with Zeneli, has single-handedly found players, trained them and developed the team in Kosovo. But with his eyes set on leaving Kosovo one day, he is worried that without the funding, infrastructure and support in place, Kosovo’s fledgling curling community will fall apart. The value of curling does not lie in its ability to win Kosovo medals, Andersen said. He sees its inclusivity as a sport and the communities that it can build as more important. While the minimum age to play at senior level in international football is 18, the minimum age to compete in curling in a senior league is over 50, and has no obstacles thanks to the ability to play with a walking stick or in a wheelchair. Peter Andersen and Eldena Dakaj training at the facility in Bratislava, Slovakia. | Photo: Peter Andersen. But the nearest proper training facility is more than 1,000 kilometers away, in Slovakia. This means that the curling team only trains on a real rink twice or three times a year. “It will be impossible to have a real ice rink in Kosovo in the near future. This is really bad; just to go and train we have to go through the whole process of getting flights and visas,” said Zeneli. Kosovo’s Ministry of Culture, Youth and Sport is pouring money into the development of sport in Kosovo. But without the medals, acclaim or celebrity athletes to promote and endorse small alternative sports, pursuits like curling are being left behind. The chances of the team training in Kosovo on something other than a plastic rink with wheels are non-existent. Zeneli compares their journey to the famed fictional 1990s Jamaican bobsled team from the film Cool Runnings. The similarities between them are indeed striking. Despite having no ice rink, and no government support, the Kosovo curling team is still aiming for success at the highest levels of the competition in the world. Without the support they are seeking to help them train, their story will likely not have the same happy ending as the movie, however. “The only equipment that we have in Kosovo is for street curling – a plastic rink a third of the size of a normal curling rink; that is usually used just to demonstrate the concept of curling,” noted Andersen. 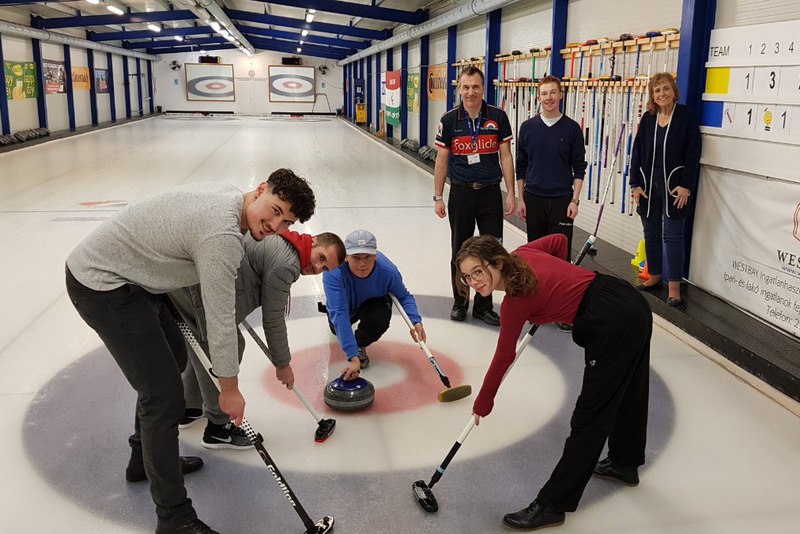 With proper funding, the team would aid the development of curling as a youth sport, traveling to schools in Kosovo to introduce curling and encourage its inclusion in the physical education curriculum. “That’s the aim, to raise as much awareness as possible. That’s why we’re asking for donations, so that we can get there and also maybe some kids will be hear about it and want to try it out,” Zeneli said. The budget for the Ministry of Culture, Youth and Sport is estimated at 41 million euros for 2019. This is a rise of 6 million euros from 2018. In the last few years, around 50 per cent of this budget has been allocated to sport alone. Nine million euros of the budget is allocated to subsidies and transfers, which mainly covers the costs of Kosovo’s sporting federations. Some 25.5 million euros is allocated to capital investments, which is usually the construction of recreation centers, sports halls and other facilities related to sport. The year 2016 was a breakthrough year for Kosovo sport, when the country joined the European and World football associations, UEFA and FIFA. Kosovo now belongs to more than 25 international sporting federations. In February, the Sports Minister signed two regulations that finalized the financing structure for Kosovo’s sporting federations. They split sports into four separate funding categories, ranging from A to D.
Sports in category A are awarded 3,400 or 2,000 euros per “point”, depending on whether they are a collective or individual sport. Sports in category B receive 1,600 euros per point, while those in C get 1,200 euros and those in D, 800 euros per point. The minister said the amount of funding awarded through this point system is based on their merits. “All these increases that have occurred for 2019 … have a single objective, that Kosovo is as internationally present as possible, to get as many awards and prizes as possible, as well as to strongly support all our athletes in preparing for the Tokyo 2020 Olympics,” the minister said when the regulations were signed. “Given that Kosovar athletes have won about 100 medals in 2018, and considering this great sporting success, we have decided to increase the budget for the federations for athletes 100 per cent,” he added. While it is the ministry that has blocked possible funding for the curling team, its affiliation with the Kosovo Olympic Committee has also resulted in significant barriers to development. The Kosovo Curling Federation was established by the now-president of the Kosovo Olympic Committee, Besim Hasani, when Kosovo was attempting to join the International Olympic Committee, IOC, so that its athletes could compete in the Olympics. But, according to Zeneli and Andersen, the Committee had no intention of developing curling when it set up the federation. “They set up the Curling Federation … just to get one more recognition by an international sports body, to further their application to the IOC. Really, it was more of a technicality at the time,” said Zeneli. The IOC officially recognised the Olympic Committee of Kosovo in 2014 and Kosovo became an official member state following the 2016 Olympics in Brazil, where Kosovo judo athlete Majlinda Kelmendi won a gold. The World Curling Federation admitted Kosovo in 2012, but as a provisional member only. This gave it access to development assistance funding, but barriers to its full participation in the sport and access to more substantial external funding remain. Before it can become a full member, Kosovo must participate in two international competitions, and needs at least three clubs in two different regions in Kosovo to be recognized as a Federation that can receive funding in Kosovo itself. “The legal situation of the Kosovo Curling Federation has come with lots of problems financially. We have a couple of people and businessmen who are willing to support us, but the curling federation’s lack of real status means they can’t do anything,” said Zeneli. “They would need to sign a contract, and since we’re attached at the hip to the Kosovo Olympic Committee, we can do nothing; we can’t even have our own bank account,” he continued. “There’s no guarantee that the sponsorship money will actually get to the Curling Federation if it goes into the Kosovo Olympic Committee bank account,” he added. However, this has not hindered some thriving alternative sports in Kosovo, including minigolf, karate, paragliding, archery and wrestling. They have all been awarded significant public funding for 2019. (From L to R) Micah Bintz, Blend Halili, Henri Puska, Eldena Dakaj. At the back, Scottish National Coach, David Jones, Peter Andersen and former RIT Kosovo (AUK) President Sharon Hart. Photo: Peter Andersen. Zeneli and Anderson, meanwhile, remain undeterred when it comes to curling. They have their sights set high as, little by little, they build their own path to success. “If we raise awareness about this sport and get schoolkids involved through street curling, once we come back from the world cup, we can expect more support from more institutions and from people in general,” Andersen said. “We will ask these institutions for help to create some kind of semi-professional facility and get the stones rolling,” he concluded. To support the Kosovo curling team, follow this link to their fundraising page.